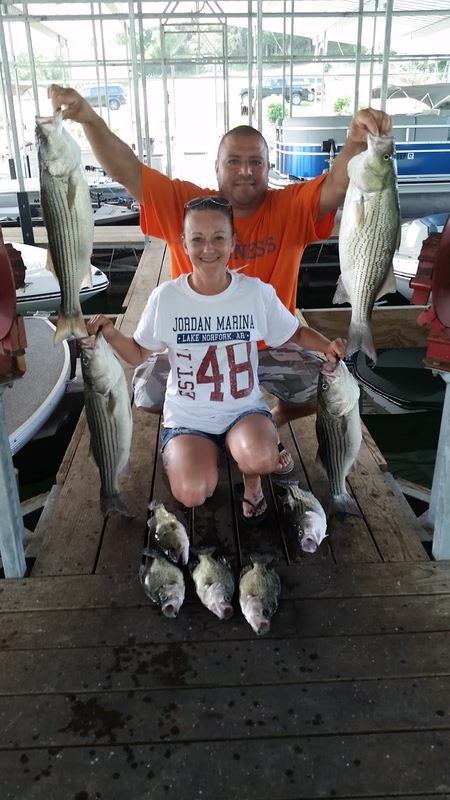 Norfork Lake fishing has been good and has had some very interesting occurrences that are not typical based on my prior years experience. If you are looking for some fun topwater action, it has been occurring for the last several weeks. 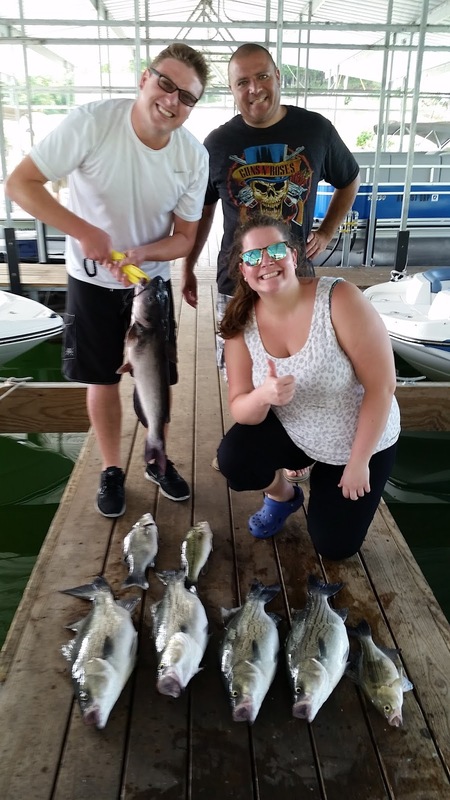 White bass and hybrids are erupting in the mid-lake to northern parts of the lake in the mornings and the afternoons. 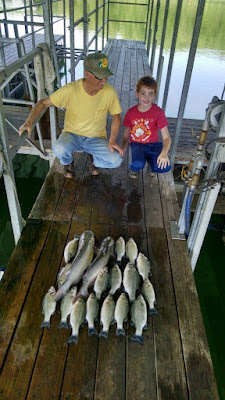 The small to mid sized whites are on the surface, but if you get down 5 - 10 feet the bigger whites are feeding heavily. I suggested using a Kastmaster, blade type bait, to some of my guests. They found the feeding frenzy this morning and had a blast. The catfish bite is also doing very well. Some of our guests have set trot lines in coves in about 10 feet of water and are catching blues and channels over night, as well as, a few during the day. 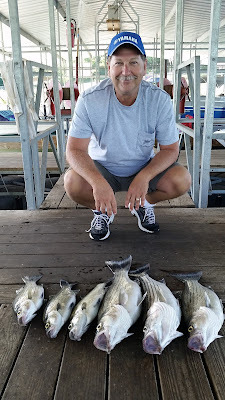 I have caught some really nice size blues in about 50 feet of water on the sides of points with a sharp drop off. 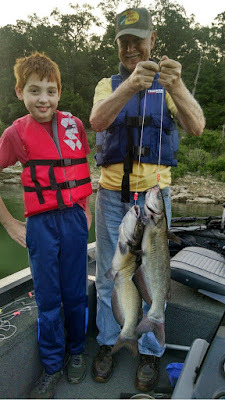 My catfish have been caught using live thread fin shad. 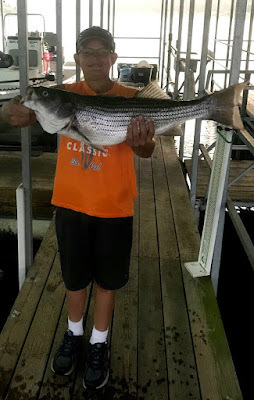 The striped bass and hybrid bass bite is good if you can locate the schools of fish. I have been fishing in 2 different areas, but I can see the fish are slowing moving out. I did a little looking around different areas from Point 2 down towards the Jordan area. I marked a few fish in all areas, but didn't find anything really exciting. 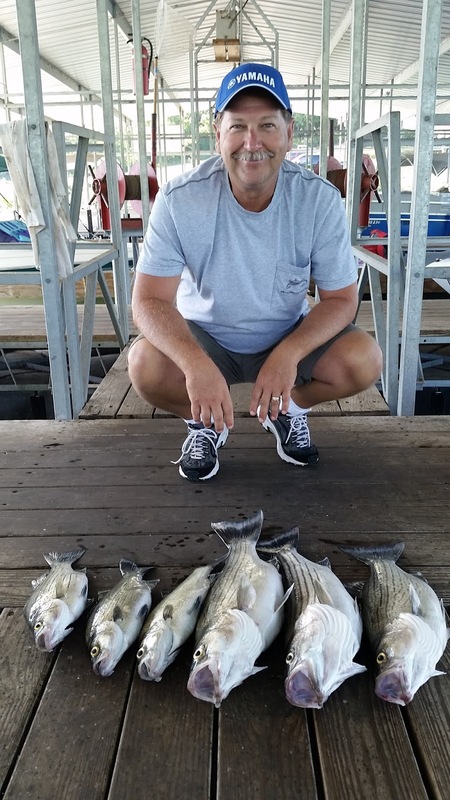 In the last spot I did find small schools of stripers that were still feeding. A first time striped bass fisherwomen landed a nice 8 pounder out of this school. We had 2 other rods bent to the water at the same time, but we missed both of them. After this flurry of activity the fish moved on and we headed home. I am going to check this spot out much earlier in the morning tomorrow. I have been mainly using thread fin shad, but spoons are also working. If you enjoy trolling you should be able to pick up some nice fish. Umbrella rigs and swim baits are both catching fish. 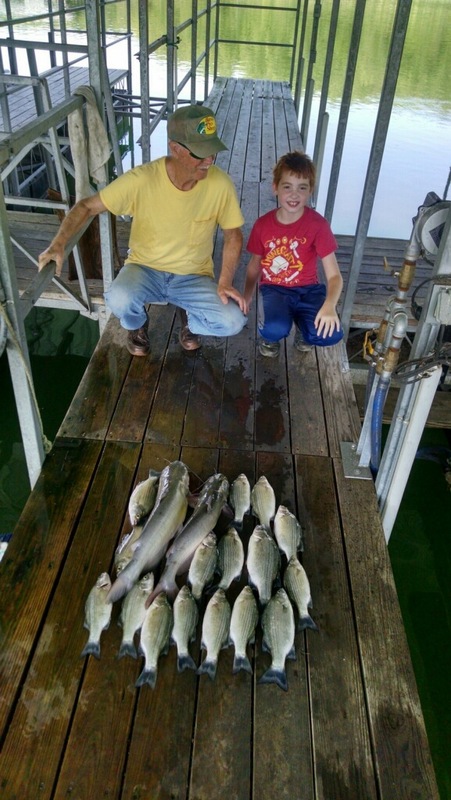 The trick is to get your bait down to 30 - 40 feet deep. Look from Point 2 to the dam out in the deeper water along bluff lines and main lake points. Norfork Lake is holding fairly stable for both the lake level, and the surface water temperature. The lake currently sits at 554.30 ft. and the surface water temperature this morning was 87 degrees. The main lake is clear and some of the creeks and coves are somewhat stained.